In addition to being an incredibly enjoyable experience, massage therapy provides the recipient with many wonderful benefits. It is the therapist’s skilled use of their hands, applying certain amounts of pressure to certain areas of the body, that yields the results that are most needed and wanted. With hot stone massage, warm, smooth river stones act as an extension of the therapist’s hands, being glided gently over the body before being left on specific points to allow heat to penetrate muscles and relieve tension. Not only is the heated massage wonderfully relaxing, it also works to reduce tight muscles so that the therapist is able to work more deeply and relieve more tension. 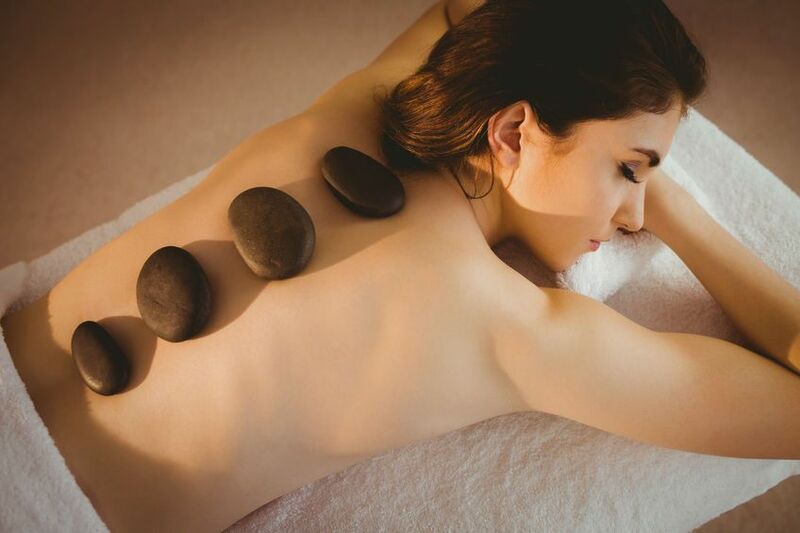 In order to produce the best results, hot stone massage must be delivered by professionals who understand the vital importance of using the right tools and techniques. At Botanica, our therapists use heat-absorbing basalt rocks that have been smoothed by natural river forces. The massage techniques that are used are the same as those used in Swedish massage and include long strokes, circular movements, vibration, tapping, and kneading. A variety of stone sizes are used in order to accommodate different muscles sizes, and they are replaced as they begin to cool. Clients are encouraged to tell their therapist if they feel that stone heat or pressure is either too little or too great, as striking the perfect balance is a necessary component of achieving the greatest benefits. Relieve muscle pain and tension. Because heat can increase blood flow, hot stone massage is often used to relax tight, sore, and painful muscles. It is also sometimes helpful in reducing muscle spasms and increasing range of motion. Reduce anxiety and stress. Hot stone massages are relaxing, and allow one to disconnect and take a break from those things that cause or contribute to their anxiety and stress. Their ability to improve circulation can also help the individual to better counter the physical effects of stress. Promote more restful sleep. Since hot stone massages allow one to relax more deeply, they can help the individual to experience deeper, more restful sleep. Relieve some of the symptoms associated with autoimmune diseases. Fibromyalgia and rheumatoid arthritis are examples of autoimmune diseases that often result in chronic pain across much of the body. In some cases, hot stone massage may be able to temporarily relieve this pain. Decrease symptoms associated with cancer. A study that was published in the Journal of Pain and Symptom Management revealed that cancer patients who received massage therapy–and most especially Swedish massage techniques–experienced symptom relief as a result. Help boost immunity. One study from 2010 indicated that even a single massage session may boost one’s immune system. While hot stone massages are definitely wonderful, they may not be appropriate for everyone. Clients who suffer from diabetes, high blood pressure or heart disease or who are taking blood thinning medications, are pregnant or are sunburned should avoid hot stone massages. That said, those individuals who are suffering from muscle tension or pain, insomnia or stress and who do not also suffer from an underlying medical condition may benefit enormously from the healing benefits provided by a hot stone massage.